Despite its Trainman status, the new O-scale Dash 8 features plenty of separately applied parts, many of which are evident in this photo. Note the multitude of hand grabs on the cab and nose, the sunshades and windscreens on the cab sides, and the snowplow on the pilot. This conventionally set up model even featured working ditch lights! I do believe that one of the most important virtues a model railroader can possess is patience. Not only the patience one must have to assemble a tedious craftsman-style kit or to plan and execute a room-size layout, but also the patience one needs in waiting for that favorite railroad equipment prototype to finally be rendered in their choice scale. Case in point, to the cheers of many O-gaugers, Atlas O announced a General Electric (GE) Dash 8-40CW for its Trainman line back in 2009. Unfortunately, unexpected delays in the manufacturing process prevented its release as scheduled — to the great disappointment of Atlas and railfans alike. In 2014, the Dash 8 was actually re-announced yet again. 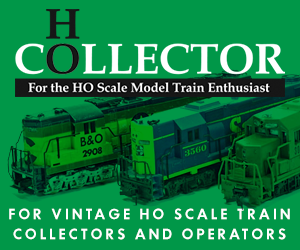 Nevertheless, after waiting for a decade, the good modeler’s persistent patience has paid off, and this summer saw the O-scale (1/48) GEs finally roll out of the company’s New Jersey-based roundhouse and onto O-gauge layouts across the country. 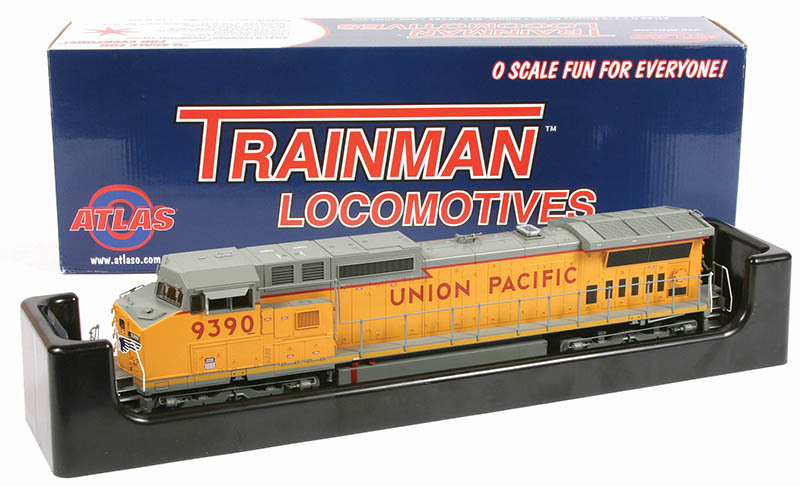 Available as both 3-rail and 2-rail models for either conventional operation or optional factory-equipped with command control and sound, the Trainman Dash 8s are available in this initial release decorated for BNSF, CSX, Santa Fe, and Union Pacific (UP), each with two road numbers. With the models now in hand, the question asked, was the seemingly endless wait worth it? Follow along as I check out the Armour-Yellow-and-Harbor-Mist-Gray-clad UP sample Model Railroad News recently received, and you be the judge. The Atlas O Trainman Dash 8-40CW is initially being offered decorated for BNSF, CSX, Santa Fe, and, as shown here, UP. Union Pacific purchased 204 wide cab Dash 8s (numbers 9356–9559) from GE between 1989 and 1993. Atlas has chosen to model UP 9390 as it appeared between roughly 2005 and 2015. Today, the unit continues to roam UP rails across the country, boasting a large U.S. flag and “Building America” slogan on its hood sides. It is quite appropriate that MRN should be reviewing a Union Pacific-decorated unit. UP 9100 was the very first Dash 8 that rolled out of General Electric’s Erie, Pa., shops back in November 1987 and brought with it the dawning of the third generation of North America’s diesel era. The model Dash 8-40C/CW was the culmination of a quarter-century’s work by GE beginning with the U25B to gain the lead in diesel-electric motive power production over long-time rival General Motor’s Electro-Motive Division (EMD). 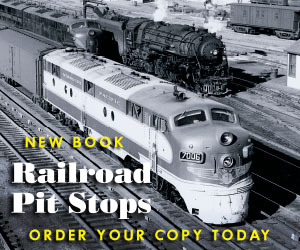 The initial horsepower race between the two competitors continued throughout the 1960s and 1970s until the railroad industry began stressing reliability and fuel efficiency at the top of their shopping lists. GE summarily countered with its Dash 7 lineup and the well-received C30-7 diesel in 1976 that went head-to-head with EMD’s problem-plagued SD50 model and later SD60 series. However, there was no stopping General Electric during this period. With momentum building and banking on its extensive research and development in the areas of prime mover enhancements and computerized controls, the company finally broke the invisible sales barrier in the diesel locomotive market with its introduction of the Dash 8 series, which propelled the builder to the Number One spot. The Dash 8 eventually evolved into the very popular Dash 9 and the next generation’s environmentally friendly ES44DC or GEVO Evolution Series. GE’s Dash 8 lineup actually included four-axle models and six-axle versions, both with standard and wide North American safety cabs, plus full-cowl carbodies for Canadian roads. Atlas previously tackled the four-axle Dash 8-40BWs in O scale back in 2002 in its Master Locomotive lineup, but it wasn’t until 2018 that the model railroad manufacturer introduced the more popular six-axle Dash 8 wide cab variant, as presented here — almost three decades after the first of the series left the GE production line. 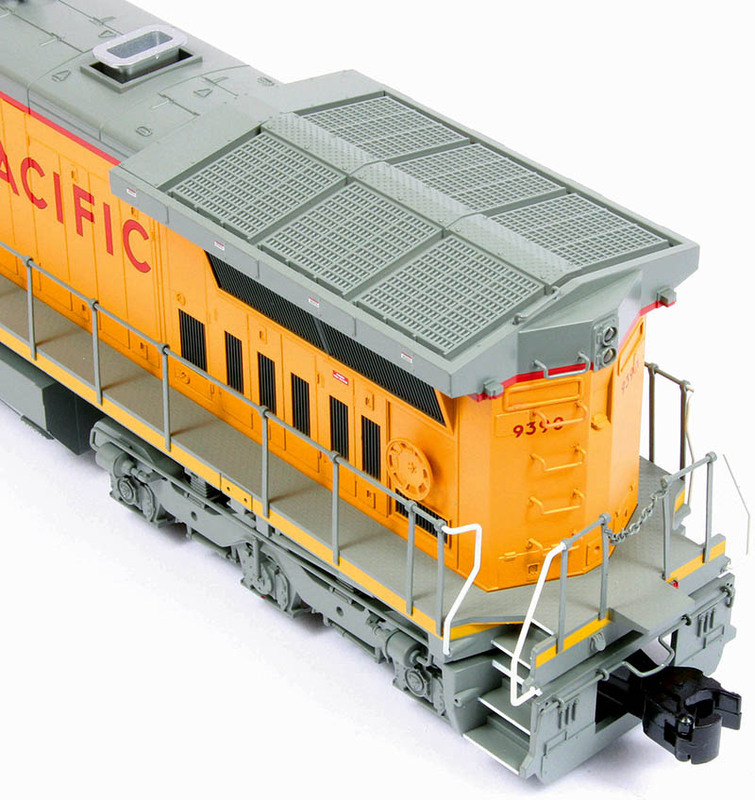 From this view, you see evidence of the extensive wire grabs and other details included on this Trainman offering, as well as the molded-in features highlighted in paint to great effect, such as the air intakes. Note also this 3-rail sample’s die-cast metal truck-mounted pilot and traditional magnetically operated knuckle coupler. Allowing the coupler and pilot to swing with the truck enables the O-gauge model to negotiate minimum O-36 diameter curves. The big news with the introduction of the Dash 8 series back in 1987, though, was its microprocessor controls, which constantly evaluated and adjusted the various auxiliary systems, such as cooling and air supply, to maximize the horsepower available for traction. This design provided consistent high horsepower, 4,000-hp to be exact (some units were later up-rated to 4,135-hp and designated Dash 8-41C/CW), continuously as necessary on high-speed intermodal trains or long coal drags. GE’s proven and refined Microsentry system kept wheel slip to an absolute minimum, and GE enhanced its model 752 traction motors (first used on the U-series) to reinforce this effort. Similarly, GE fine-tuned its 16-cylinder 7FDL prime mover — the same engine series that originally powered the U-boats of the 1960s. This endeavor was not only to meet the new horsepower rating, but also increase fuel efficiency by some 20 percent versus earlier models and to extend the life of the many engine components. Combined, these attributes offered railroads the low-cost, reliable operation they sought. Between 1987 and 1992, GE outshopped 581 of the standard cab Dash 8-40C or, as many railroads designated them, C40-8s. UP was, by far, the biggest initial supporter with 256 units on the roster; CSX followed with 147, Chicago & North Western with 77, Norfolk Southern with 75, and Conrail with 25 units. Beginning in 1989, GE started offering the wide or North American safety cab version, known as the Dash 8-40CW. Over a five-year production run, GE erected 903 wide cab units with CSX buying 268, Conrail took 216, Union Pacific acquired 204, 152 went to Santa Fe, and Locomotive Management Services (LMSX) bought 60 units and leased the fleet back to Conrail. The majority of these units remain in service today, but ownership has changed hands in many instances due to railroad mergers and resale of these now nearly 30-year-old locomotives. Unlike the older four-axle wide-cab Dash 8 high-end Master offering, Atlas O added this new model to its mid-price level Trainman product line, where quality, scale dimensions, detail, and accuracy are the priority with lower suggested retail pricing factored into the product’s design and execution. These attributes were evident to me almost immediately on opening Model Railroad News’ sample in its sturdy blue-and-white box and finding it attached to a rigid, black plastic base. The base secures the model in the package and keeps the surrounding foam liner from coming in contact with the paint and side surface details of the model. Even though there is the extra step of having to remove four bolts from the base to free up the model, the reward is a damage-free rendering and the appreciation that the manufacturer thought enough of its new offering to make this special packaging effort. The quality of this Trainman offering shines through even in the way it’s packaged. The model comes attached, via four screws anchored in its metal fuel tank, to a rigid plastic tray, much as current product HO-scale models. This set up protects fine details and the model’s finish from damage while encased in the foam liner of the box. Four plastic plugs are even included so that the modeler may fill in the screw holes in the bottom of the fuel tank. While the model may not have all the see-through, photo-etched metal grilles, cab interior with painted crew figures, and some of the other more delicate-appearing details of the company’s pricier Master-series locomotives and rolling stock, there is still a good helping of separately applied parts to catch the modeler’s eye and impress. These details include wire hand grabs, sturdy metal railing and stanchions (a big plus if the model is handled often), sunshades and cab side windscreens. Also included are brass three-chime air horns, exhaust stack located on the engine compartment roof, radio antennas on the cab roof, coupler cut levers, end platform safety chains, a bell hung beneath the frame, handbrake wheel on the left rear hood side, and a die-cast metal fuel tank with plastic air reservoir tanks applied. It’s actually hard to see the difference in some details on this Trainman offering compared to a Master version model, outside of the lack of a cab interior, since Atlas has incorporated many of the details directly into the tooling and accented them with color to great effect. Note the windshield wipers — they are not separate parts, but molded-in both the windshield glazing and upper cab, yet, painted silver, they stand out as independent details. Likewise, the rear carbody air intake screens include gray paint highlighting, as if they, too, were separate additions to the hood. I see no shortcuts taken in the proportional accuracy of this 17.5-inch-long (over the pilots) GE rendering. My measurements taken of the length of the model over its pilots, between truck centers, and overall height and width matched those dimensions found in published drawings of the 70-foot, 8-inch-long (over the coupler pulling faces) prototype. Likewise, all the various access doors and hatches are present, each displaying hinge and latch details, along with body panel lines and even a raised safety tread pattern appears on the walkway platforms. Finally, the die-cast metal General Steel Castings/Adirondack three-axle trucks not only display the proper wheelbase, but also include accurately rendered detail. You’ll find that same attention to detail for the hand-applied brake cylinders, air lines, and blackened 40-scale-inch diameter wheels. From any angle, this O-gauge Trainman release is impressive. I especially found the execution of the windshield wipers quite clever. Appearing as more costly add-on pieces, you’ll discover the wiper arms are partly molded into the window glazing and partly incorporated into the cab shell. The wipers, highlighted with silver paint, give a multi-dimensional appearance. When it comes to road-specific details, I wasn’t expecting any for this lower-price Trainman locomotive, but, once again, Atlas shows its dedication to getting the details right. For MRN’s Union Pacific unit, a snowplow appears on the front pilot, and ditch lights are present too just below the deck. For those fans of Santa Fe heritage Dash 8-40CWs, the manufacturer even tooled up the correct Gull Wing-style cab, which was a modification the railroad requested due to clearance issues at certain mine-loading facilities in the Southwest. Hand-in-hand with these embellishments, I found the decoration on the Dash 8 offerings done expertly. 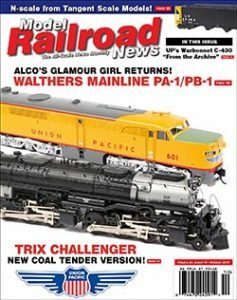 Model Railroad News’ UP 9390 (9529 also being offered) was well-executed with opaque color coverage and sharp graphics. Of particular note, be sure to examine the GE builder’s plate on the lower right side the cab along with the many warning signs dotting the hood doors and roof of the model; again, all unexpected details for a budget-priced Trainman model. Both the paint and lettering arrangement found on the O-scale UP 9390 appear to be implemented per railroad practice for the decade running approximately between 2005 and 2015. By October 2005, UP 9390 appeared in the new lightning stripe scheme along with the full-width UP nose wings and the reflective yellow frame bands. This scheme would last until April 2015 when the unit saw repainting with the large U.S. flag on its hood sides and received the “Building America” slogan, which this locomotive still displays in 2018. UP 9390 was one of the first 50 wide-cab Dash 8s (numbers 9356–9405) to arrive on the road between December 1989 and March 1990. By November of that year, the delivery of 154 more wide cabs (numbers 9406–9559) would take place. In August 1993, UP changed the class designation on these units to “C40-8W,” while also eventually up-rating a large portion the fleet to “C41-8W” status over the ensuing years. This Atlas photo shows the 2-rail O-scale Dash 8-40CW diesel locomotive decorated for Santa Fe SuperFleet service. Notice the angle on the side of the cab roof over the sunshades. For clearance issues, Santa Fe required this special “Gull Wing” cab from GE, and Atlas includes it on this and BNSF offerings. 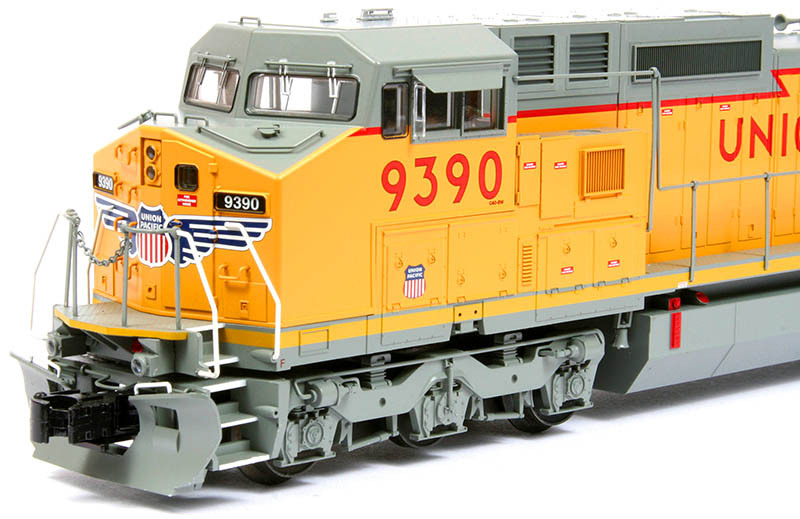 Under the hood, this 3-rail UP Dash 8 diesel model possesses the standard mechanicals and electronics of the typical Atlas O-scale diesel locomotive design, all mounted atop a rigid stamped-steel chassis. A flywheel-equipped can motor is vertically mounted to the metal gearbox on each truck. In turn, all axles are geared with only the outside axle’s wheels on each truck flanged for the long wheelbase trucks to accomplish minimum O-36 diameter curve operation. In addition, the model utilizes traditional magnetically operated knuckle couplers attached to the truck-mounted die-cast metal pilots to aid in this negotiation. In turn, the inside and middle axle wheels of each truck include traction tires, which helped to provide this 4-pound, 12-ounce O-gauge model with ample traction for hauling two dozen or more scale-sized freight cars on level track with ease. Along with its standard directional LED lighting, this conventionally set up unit surprisingly included operating ditch lights that even flashed when the horn sounded. Yes, you read correctly — despite this offering being a Trainman locomotive and non-command control-equipped, it still features an operating horn along with a bell to boot, which you can activate by any alternating current (AC) transformer equipped with sound buttons. What a bargain! Furthermore, I clocked this sample with a low speed of 14.3 scale miles per hour, while the high speed was well beyond the prototype’s 70 miles per hour maximum — pretty much as expected for a conventionally controlled 3-rail powered locomotive. For those hi-railers seeking even more operating options, the Atlas Trainman Dash 8s come outfitted with the TrainMaster Command Control (TMCC) system and RailSounds (licensed by Lionel), which works with newer Lionel Legacy command control equipment. Although we were not privy to a sample so equipped, TMCC offers the operator access to activating the many familiar audio effects of the RailSounds system (horn, bell, squealing brakes, prime mover diesel roar, CrewTalk, etc. ); setting the speed and momentum parameters; and operating the included remotely controlled die-cast metal ElectroCouplers. And just like Atlas’ Master line counterparts, this particular Trainman command-equipped offering also boasts a functioning exhaust unit and Electric Railroad Company “Cruise Commander” technology. Of course, 2-rail O-scalers have a treat in store for them with the choice of either a standard DC or Digital Command Control (DCC)-ready version with scale flange wheels, fixed pilots, operation on minimum 36-inch radius curves, and body-mounted metal Kadee-style magnetic operating knuckle couplers or a Gold edition that includes a factory-installed ESU LokSound DCC decoder and oscillating ditch lights. Again, I did not get to sample a 2-rail offering either, but, based on LokSound-outfitted samples I have personally witnessed in the manufacturer’s Master product line, I bet the Gold models deliver not only great DCC performance, but an awesome and authentic-sounding experience as well. Relative to the going price of most O-scale diesel locomotives on the market today, the new Atlas Trainman Dash 8-40CW delivers the most bang for the buck I’ve seen in a long time. I think the conventional units, whether set up for 2-rail or 3-rail, are the best bargain at less than $270 retail, considering all the unexpected details, superb decoration, and included operating features on the 3-rail unit alone, but command control enthusiasts will feel the cost savings as well with those units so equipped fetching a reasonable suggested retail price of $430. Therefore, with the evidence presented, I think we can all agree on the same verdict — the extended wait for these Trainman renderings was well worth it!